Hotel Guadalmina Golf and Spa Resort is located within a popular residential area of Guadalmina, just ten minutes from both Marbella and Estepona, and five minutes from Puerto Banus. The Hotel has 178 double rooms and junior suites which are elegantly decorated with spacious terraces offering wonderful views of the Mediterranean Sea. Hotel Guadalmina Golf and Spa Resort enjoys direct access to an extensive Mediterranean beach and is surrounded by two golf courses of Guadalmina Golf Club. Guests can enjoy International cuisine at the Taray Restaurant, Cocktails by the Poolside Terrace and the outdoor sea water swimming pool. The Hotel Guadalmina Spa Centre has a water area with dynamic pool, experience showers and individual treatment booths, sauna and Turkish bath, with Golf & Spa packages available through Ascot Golf. Group Offer available for 8 golfers visiting Guadalmina Spa and Golf Resort! Group Leaders receive complimentary Hotel+Golf for every 7 golfers. Offer Conditions: Group Offer may be combined with Ascot Golf Group Discount for 8-15, 16+ persons. Listed Package Prices: Listed Golf Package prices apply with 1 in 8 Persons FREE. Listed Golf Packages at Guadalmina Spa & Golf Resort include Standard Room, Breakfast & Golf. Listed Package Prices: Listed Golf Package prices apply with FREE Drinks Deal. The hotel’s 178 rooms and suites offer generous balconies overlooking the sea, the gardens or the golf course. All rooms include living room area, fully equipped bathroom, Satellite Plasma TV, safety deposit box, air conditioning and minibar. Standard Room (45m²) Double/Twin Room with excellent views of the golf course or garden from terrace. Superior Room (50m²) Double/Twin Room with magnificent views to the Golf Course and Sea or to the Garden and Sea from terrace. Junior Suite (75m²) Double Room with stunning views overlooking the Mediterranean Sea from private terrace. The Junior Suites are located in the main hotel building. Their fully equipped new bathrooms have hydro-massage bath and separate shower. Cocoa Restaurant specializes in Mediterranean cuisine. Enjoy your meal while watching the wonderful views of the Guadalmina South Golf Course and the Mediterranean Sea. Taray Restaurant offers a wide range of regional and international dishes. On Sundays enjoy traditional and renowned Buffet Lunch on one of the spacious terraces. Acqua Bar offers fresh cocktails or light meal in the lively poolside terrace in the snack bar. 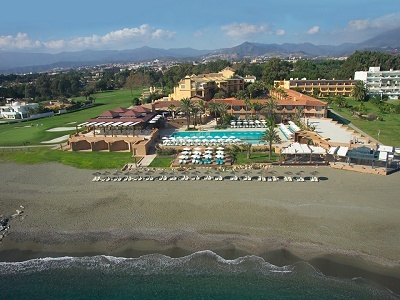 Beach Club Enjoy typical Mediterranean cuisine by the sea during the Summer Season. Leisure facilities at Hotel Guadalmina include an indoor swimming pool, outdoor sea water swimming pool, solarium, tennis courts, fully equipped gym, spa and two golf courses. The Hotel also runs a Kids Club during Easter, July and August for children aged 3 – 12 years. Hotel Guadalmina Golf and Spa Resort is in the popular and luxury area of Guadalmina, located only ten minutes from both Marbella and Estepona, and five minutes from Puerto Banus where there are plenty of restaurants, bars and shops to choose from. 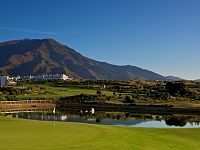 This is the original course of the Guadalmina Golf complex - designed by Javier Arana in 1959 and is renowned for its difficulty, thus making it more suitable for experienced players. Fairways are narrow and well protected by old trees requiring straight shots. The south course is also popular as 2 of the holes play directly along the coast. Designed by Folco Nardi in 1973, this course runs almost parallel to its southern “brother”. It is shorter and hillier than the south course and has more water obstacles. Located in the most prestigious area of Marbella, just 5 minutes from the city centre, Rio Real runs alongside Rio Real River until it reaches the Mediterranean Sea. The course is suitable for every player, thanks to its more elevated holes, which make them even more appealing and memorable. In general the greens are quite flat, well maintained and protected by the surrounding bunkers. The 10th, a dogleg to the right, leads onto the spectacular 11th tee, where you have a great view down onto the green situated on the other side of the river! 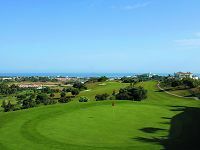 Atalaya New Course, Estepona was opened in 1992 and is more hilly, with smaller greens, than the Atalaya Old Course. The fairways are also more narrow and sloping and there are several lakes to negotiate. There are views of the Mediterranean and Gibraltar, in addition to an abundance of wildflowers and gorse bushes that make this an idyllic setting. 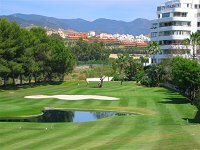 Valle Romano Golf, in Estepona, is an outstanding 18-hole course, fitted out to play host to the most demanding and prestigious tournaments. A wooden booth with an interphone has been fitted on the green of the 8th hole for such purpose with a direct line to the restaurant. There is a menu in this booth that contains sandwiches, various sweet and savoury appetizers, soft drinks and energy drinks that players can order as they pass through this part of the course and get at hole 9. Since Valle Romano was no more than a plan, Seve had given it his backing and did so right up to the end. On our visits to Pedreña, as he battled against his illness, he always wanted to know, "How´s the course going? How are the houses?" Eager for any news, however insignificant it may have been. He would listen to us with endless attention and give his opinion, which was always welcome. Every player who passes through Valle Romano will take away a special memory of Seve. Hole 9, the most distinctive one on the course, bears his name.